Kandawgyi Lake is located in the centre of Yangon. Surrounded are the Kandawgyi Kanpat Road, meaning the road bordering the lake. Kandawgyi meaning the great lake in Myanmar Language. It is a beautiful picnic spot together forming the Kandawgyi Nature Park. It is surrounded by the Yangon Zoological Garden, Aquarium, Hotel Nikko Royal Lake, Kantharyar Hospital, and many restaurants. The lake also contains the glittering mythical bird called the Karaweik. 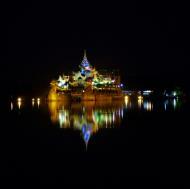 It is a restaurant in a form of a boat and it is one of the main tourist attractions in Yangon. There are many species in the lake. The beautiful lake is reserved and maintained to keep the beauty of the natural lake. The night scene of the lake is like an imaginary view of mother earth's beauty. 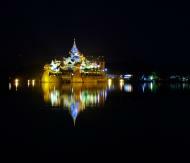 Kandawgyi Lake (literally 'great royal lake', formerly Royal Lake), is one of two major lakes in Yangon, Burma (Myanmar). Located east of the Shwedagon Pagoda, the lake is artificial; water from Inya Lake is channelled through a series of pipes to Kandawgyi Lake. It was created to provide a clean water supply to the Cantonment (modern-day downtown) of Yangon during British colonial administration. It is approximately 5 miles (8 km) in circumference, and has a depth of 20 to 45 inches (50 to 115 cms). The 150-acre (60.7-hectare) lake is surrounded by the 110-acre (44.5-hectare) Kandawgyi Nature Park, and the 69.25-acre (28-hectare) Yangon Zoological Gardens, which consists of a zoo, an aquarium and an amusement park. 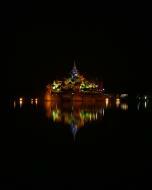 The Karaweik is a famous icon along Kandawgyi Lake's shores. The lake itself is bounded by Natmauk Street to its north and east, Bahan Street to its west, and Kanyeiktha Street to its south. Along the eastern shorelines of the lake is the famous Karaweik, a concrete replica of a Burmese royal barge built in 1972. It houses a buffet restaurant today. Yangon (also known as Rangoon) is the largest city and a former capital of Burma. It is the capital of Yangon Division. Although the military government has officially relocated the capital to Naypyidaw since March 2006, Yangon, with a population of four million, continues to be the country's largest city and the most important commercial center. Yangon's infrastructure is relatively undeveloped compared to those of other major cities in Southeast Asia. Yangon has the largest number of colonial buildings in Southeast Asia today. While many high-rise residential and commercial buildings have been constructed or renovated throughout downtown and Greater Yangon in the past two decades, most satellite towns that ring the city continue to be deeply impoverished. Yangon is a combination of the two words yan and koun, which mean ‘enemies’ and ‘run out of’ respectively. It is also translated as ‘End of Strife’. ‘Rangoon’ most likely comes from the British imitation of the pronunciation of ‘Yangon’ in the Rakhine dialect of Burmese. Yangon was founded as Dagon in the 6th century AD by the Mon, who dominated Lower Burma at that time. 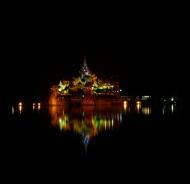 Dagon was a small fishing village centered about the Shwedagon Pagoda. In 1755, King Alaungpaya conquered Dagon, and renamed it ‘Yangon’. The British captured Yangon during the First Anglo-Burmese War (1824–26) but returned it to Burmese administration after the war. The city was destroyed by a fire in 1841. 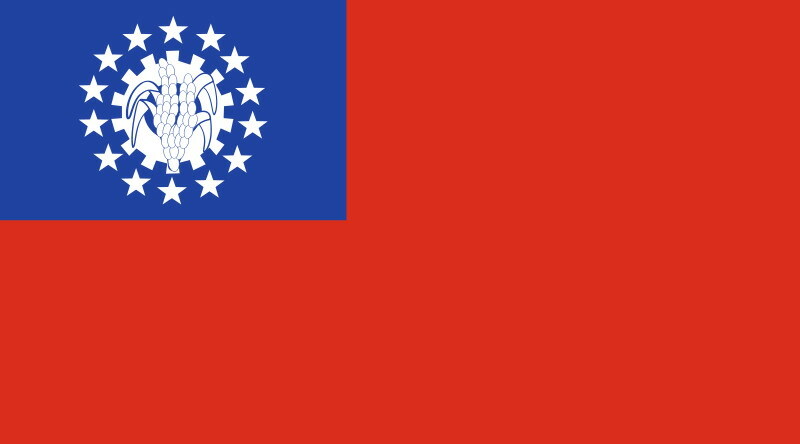 The British Empire seized Yangon and all of Lower Burma in the Second Anglo-Burmese War of 1852, and subsequently transformed Yangon into the commercial and political hub of British Burma. Based on the design by army engineer Lt. Alexander Fraser, the British constructed a new city on a grid plan on delta land, bounded to the east by the Pazundaung Creek and to the south and west by the Yangon River. By the 1890s Yangon's increasing population and commerce gave birth to prosperous residential suburbs to the north of Royal Lake (Kandawgyi) and Inya Lake. The British also established hospitals including Rangoon General Hospital and colleges including Rangoon University. Colonial Yangon, with its spacious parks and lakes and mix of modern buildings and traditional wooden architecture, was known as ‘the garden city of the East.’ By the early 20th century, Yangon had public services and infrastructure on par with London. Before World War II, about 55% of Yangon's population of 500,000 was Indian or South Asian, and only about a third was Bamar (Burman). Karens, the Chinese, the Anglo-Burmese and others made up the rest. After World War I, Yangon became the epicenter of Burmese independence movement, with leftist Rangoon University students leading the way. Three nationwide strikes against the British in 1920, 1936 and 1938 all began in Yangon. Yangon was under Japanese occupation (1942–45), and incurred heavy damage during World War II. Yangon became the capital of Union of Burma on 4 January 1948 when the country regained independence from the British. Since independence, Yangon has expanded outwards. Successive governments have built satellite towns such as Thuwunna and Okkalapa in the 1950s to Dagon Myothit (New Dagon) in the 1990s. Today, Greater Yangon encompasses an area covering nearly 600 km². During Gen. Ne Win's isolationist rule (1962–88), Yangon's infrastructure deteriorated through poor maintenance and did not keep up with its increasing population. In the 1990s, the current military government's relatively more open market policies attracted domestic and foreign investment, bringing a modicum of modernity to the city's infrastructure. Some inner city residents were forcibly relocated to new satellite towns. Many colonial-period buildings were demolished to make way for high-rise hotels, office buildings, and shopping malls, leading the city government to place about 200 notable colonial-period buildings under a ‘Heritage List’. Major road and bridge-building programs have resulted in six new bridges, and five new highways linking the city to its industrial hinterland. Still, much of Yangon remains without basic municipal services such as 24-hour electricity and regular rubbish collection. Yangon has become much more indigenous Burmese in its ethnic make-up since independence. After independence, many South Asians and Anglo-Burmese left. Many more South Asians were forced to leave during the 1960s by Gen. Ne Win's xenophobic government. Nevertheless, sizable South Asian and Chinese communities still exist in Yangon. The Anglo-Burmese have effectively disappeared, having left the country or intermarried with other Burmese groups. Yangon was the center of major anti-government protests in 1974, 1988 and 2007. The city’s streets saw bloodshed each time as protesters were gunned down by the government. In May 2008, Cyclone Nargis hit Yangon. While the city had few human casualties, three quarters of Yangon's industrial infrastructure was destroyed or damaged, with losses estimated at US$800 million. In November 2005, the military government designated Naypyidaw, 200 miles (322 km) north, as the new administrative capital, and subsequently moved much of the government to the newly developed city. At any rate, Yangon remains the largest city, and the most important commercial center of Burma. Yangon is located in Lower Myanmar at the convergence of the Yangon and Bago Rivers about 19 miles (30 km) away from the Gulf of Martaban at 16°48' North, 96°09' East (16.8, 96.15). Its standard time zone is UTC/GMT +6:30 hours. Yangon has an equatorial monsoon climate under the Köppen climate classification system. Until the mid 1990s, Yangon remained largely constrained to its traditional peninsula setting between the Bago, Yangon and Hlaing rivers. People moved in, but little of the city moved out. Maps from 1944 show little development north of Inya Lake and areas that are now layered in cement and stacked with houses were then virtual backwaters. Since the late 1980s, however, the city began a rapid spread north to where Yangon International airport now stands. But the result is a stretching tail on the city, with the downtown area well removed from its geographic center. The city's area has steadily increased from 86.2 km² in 1940 to 208.51 km² in 1974, to 346.13 km² in 1985, and to 598.75 km² in 2008. Downtown Yangon is known for its leafy avenues and fin-de-siècle architecture. The former British colonial capital has the highest number of colonial period buildings in Southeast Asia. Downtown Yangon is still mainly made up of decaying colonial buildings. The former High Court, the former Secretariat complex, the former St. Paul's English High School and the Strand Hotel are excellent examples of the bygone era. Most downtown buildings from this era are four-story mix-use (residential and commercial) buildings with 14-foot ceilings, allowing for the construction of mezzanines. Despite their less-than-perfect conditions, the buildings remain highly sought after and most expensive in the city's property market. A latter day hallmark of Yangon is the eight-story apartment building. (In Yangon parlance, a building with no elevators (lifts) is called an apartment building and one with elevators is called a condominium. Condos which have to invest in a local power generator to ensure 24-hour electricity for the elevators are beyond the reach of most Yangonites.) Found throughout the city in various forms, eight-story apartment buildings provide relatively inexpensive housing for many Yangonites. The apartments are usually eight stories high (including the ground floor) mainly because the city regulation, until February 2008, required that all buildings higher than 75 feet or eight stories install elevators). The current code calls for elevators in buildings higher than 62 feet or six stories, likely ushering in the era of the six-story apartment building. Although most apartment buildings were built only within the last 20 years, they look much older and rundown due to shoddy construction and lack of proper maintenance. Unlike other major Asian cities, Yangon does not have any skyscrapers. Aside from a few high-rise hotels and office towers downtown, most high-rise buildings (usually 10 stories and up) are ‘condos’ scattered across prosperous neighborhoods north of downtown such as Bahan, Dagon, Kamayut and Mayangon. The tallest building in Yangon, Pyay Gardens, is a 25-story condo in the city’s north. Older satellite towns such as Thaketa, North Okkalapa and South Okkalapa are lined mostly with one to two story detached houses with access to the city's electricity grid. Newer satellite towns such as North Dagon and South Dagon are still essentially slums in a grid layout. The satellite towns – old or new – receive little or no municipal services. The pattern of south to north roads is as follows: one broad 100-foot (30 m) wide broad road, two narrow streets, one mid-size street, two more narrow streets, and then another 100-foot (30 m) wide broad road. This order is repeated from west to east. The narrow streets are numbered; the medium and broad roads are named. For example, the 100-foot (30 m) Lanmadaw Road is followed by 30-foot (9.1 m)-wide 17th and 18th streets then the medium 50-foot (15 m) Sint-Oh-Dan Road, the 30-foot 19th and 20th streets, followed by another 100-foot (30 m) wide Latha Road, followed again by the two numbered small roads 21st and 22nd streets, and so on. The roads running parallel west to east were the Strand Road, Merchant Road, Maha Bandula (nee Dalhousie) Road, Anawrahta (Fraser) Road, and Bogyoke Aung San (Montgomery) Road. The largest and best maintained parks in Yangon are located around Shwedagon Pagada. 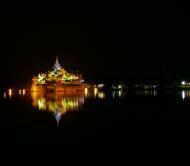 To the southeast of the gilded stupa is the most popular recreational area in the city – Kandawgyi Lake. The 150 acre (60.7-hectare) lake is surrounded by the 110 acre (44.5-hectare) Kandawgyi Nature Park, and the 69.25 acre (28-hectare) Yangon Zoological Gardens, which consists of a zoo, an aquarium and an amusement park. West of the pagoda towards the former Hluttaw (Parliament) complex is the 130 acre (53-hectare) People’s Square and People's Park, (the former parading ground on important national days when Yangon was the capital.) A few miles north of the pagoda lies the 37 acre (15-hectare) Inya Lake Park – a favorite hangout place of Yangon University students, and a well-known place of romance in Burmese popular culture. Hlawga National Park and Allied War Memorial at the outskirts of the city are popular day-trip destinations with the well-to-do and tourists. Yangon is administered by the Yangon City Development Committee (YCDC). YCDC also coordinates urban planning. The city is divided into four districts. The districts combined have a total of 33 townships. The mayor of Yangon currently is Brigadier General Aung Thein Lynn. Each township is administered by a committee of township leaders, who make decisions regarding city beautification and infrastructure. Myo-thit (lit. ‘New Towns’, or satellite towns) are not within such jurisdictions. Yangon is Myanmar's main domestic and international hub for air, rail, and ground transportation. Yangon International Airport, located 12 mi (19 km) from downtown, is the country's main gateway for domestic and international air travel. It has direct flights to regional cities in Asia – mainly, Bangkok, Hong Kong, Kuala Lumpur, Kunming, and Singapore. Although domestic airlines offer service to about 20 domestic locations, most flights are to tourist destinations such as Bagan, Mandalay, Heho and Ngapali, and to the capital, Naypyidaw. Yangon Central Railway Station is the main terminus of Myanmar Railways' 5,068-kilometre (3,149 mi) rail network whose reach covers Upper Myanmar (Naypyidaw, Mandalay, Shwebo), upcountry (Myitkyina), Shan hills (Taunggyi, Lashio) and the Taninthayi coast (Mawlamyaing, Dawei). Yangon Circular Railway runs a 45.9-kilometre (28.5 mi) 39-station commuter rail network that connects Yangon's satellite towns. The system is heavily utilized by the local populace, selling about 150,000 tickets daily. The popularity of the commuter line has jumped since the government reduced petrol subsidies in August 2007. The vast majority of Yangonites cannot afford a car and rely on an extensive network of buses to get around. Over 300 public and private bus lines operate about 6300 crowded buses around the city, carrying over 4.4 million passengers a day. All buses and 80% of the taxis in Yangon run on compressed natural gas (CNG), following the 2005 government decree to save money on imported petroleum. Highway buses to other cities depart from Dagon Ayeyar Highway Bus Terminal and Aung Mingala Highway Bus Terminal. Motor transportation in Yangon is highly expensive for most of its citizens. As the government allows only a few thousand cars to be imported each year in a country with over 50 million people, car prices in Yangon (and in Myanmar) are among the highest in the world. In July 2008, the two most popular cars in Yangon, 1986/87 Nissan Sunny Super Saloon and 1988 Toyota Corolla SE Limited, cost about US$20,000 and US$29,000 respectively. A sports utility vehicle, imported for around US$50,000, goes for US$250,000. Illegally imported unregistered cars are cheaper – typically about half the price of registered cars. Nonetheless, car usage in Yangon is on the rise, and already causes much traffic congestion in highway-less Yangon's streets. As of March 2008, Yangon had over 173,000 registered motor vehicles in addition to an unknown number of unregistered ones. Since 1970, cars are driven on the right side of the road in Myanmar. However, as the government has not required left hand drive (LHD) cars to accompany the right side road rules, many cars on the road are still right hand drive (RHD) made for driving on the left side. Japanese used cars, which make up most of the country's imports, still arrive with RHD and are never converted to LHD. As a result, Burmese drivers have to rely on their passengers when passing other cars. Within Yangon, it is illegal to drive trishaws, bicycles, and motorcycles. With over 4 million people, Yangon is the largest city by far in Myanmar. (All population figures are estimates since no official census has been conducted in Myanmar since 1983.) The city's population grew sharply after 1948 as many people (mainly, the indigenous Burmese) from other parts of the country moved into the newly built satellite towns of North Okkalapa, South Okkalapa, and Thaketa in the 1950s and East Dagon, North Dagon and South Dagon in the 1990s. Immigrants have founded their regional associations (such as Mandalay Association, Mawlamyaing Association, etc.) in Yangon for networking purposes. The government's decision to move the nation's administrative capital to Naypyidaw has drained an unknown number of civil servants away from Yangon. Yangon is the most ethnically diverse city in the country. While the Indians formed the slight majority prior to World War II, today, the majority of the population is of Bamar (Burman) descent. Large communities of Indians/South Asians and the Chinese still exist especially in the traditional downtown neighborhoods. Intermarriage between ethnic groups--especially between the Bamar and the Chinese, and the Bamar and other indigenous Burmese--is common. Burmese is the principal language of the city. English is by far the preferred second language of the educated class. In recent years, however, the prospect of overseas job opportunities has enticed some to study other languages: Mandarin Chinese is most popular, followed by Japanese, French, and Korean. Yangon is the country's hub for the movie, music, advertising, newspaper and book publishing industries. All media is heavily regulated by the military government. (Television broadcasting is off limits to the private sector.) All media content must first be approved by the government's media censor board, Press Scrutiny and Registration Division. All television channels in the country are broadcast from Yangon. TV Myanmar and Myawaddy are the two main channels, providing Burmese language programming in news and entertainment. Other special interest channels are MWD-1 and MWD-2, MRTV-3, the English language channel that targets overseas audiences via satellite and via Internet, MRTV-4 with a focus on non-formal education programs and movies, and Movie 5, a Pay-TV channel specializing in broadcasting foreign movies. Yangon has only two radio stations. Myanmar Radio National Service is the national radio service and broadcasts mostly in Burmese (and in English during specific times.) Pop-culture oriented Yangon City FM specializes in Burmese and English pop music, entertainment programs, live celebrity interviews, etc. Nearly all print media and industries are based out of Yangon. All three national newspapers – two Burmese language dailies Myanma Alin and Kyemon, and the English language The New Light of Myanmar are published by the government. Semi-governmental The Myanmar Times weekly, published in Burmese and in English, is mainly geared for Yangon's expatriate community. Over twenty special interest journals and magazines covering sports, fashion, finance, crime, literature (but never politics) vie for the readership of the general populace. Access to foreign media is extremely difficult. Satellite television in Yangon (and in Myanmar) is highly expensive as the government imposes an annual registration fee of one million kyats (US$780). Certain foreign newspapers and periodicals such as the International Herald Tribune and the Straits Times can be found only in a few (mostly downtown) bookstores. Internet access in Yangon, which has the best telecommunication infrastructure in the country, is slow and erratic at best, and the Burmese government implements one of the world's most restrictive regimes of Internet control. International text messaging and voice messaging was permitted only in August 2008. Common facilities taken for granted elsewhere are luxury prized items in Yangon (and Myanmar). The price of a GSM mobile phone is about K1.1 million (or US$900) in August 2008. In 2007, the country of 55 million had only 775,000 phone lines (including 275,000 mobile phones), and 400,000 computers. Internet penetration rate was only 0.6% of the population in 2005. Even in Yangon, most people cannot afford a computer and have to use the city’s numerous Internet cafes to access a heavily restricted Internet, and a heavily censored local intranet. The majority of Yangonites live outside downtown, and typically spend most of their day commuting to and from work. For recreation, Yangonites come out at night when the weather is much cooler. Most men of all ages (and some women) spend their time at ubiquitous tea-shops, found in any corner or street of the city. Watching European football (mostly Premier League with occasional La Liga, Serie A, Bundesliga) matches while sipping tea is a favorite pastime of many Yangonites, rich and poor alike. The average person stays close to his or her neighborhood haunts. The well-to-do tend to visit shopping malls and parks on weekends. Some leave the city on weekends for Chaungtha and Ngwesaung beach resorts in Ayeyarwady Division. Yangon is also home to many paya pwes (pagoda festivals), held during dry-season months (November–March). The most famous of all, the Shwedagon Pagoda Festival in March, attracts thousands of pilgrims from around the country. The city's museums are the domain of tourists and rarely visited by the locals. Most of Yangon's larger hotels offer some kind of nightlife entertainment, geared towards tourists and the well-to-do Burmese. Some hotels offer traditional Burmese performing arts shows complete with a traditional Burmese orchestra. The pub scene in larger hotels is more or less the same as elsewhere in Asia. Other options include karaoke bars and pub restaurants in Yangon Chinatown. Yangonites carry stashes of cash to go on shopping. Credit cards are accepted only in a few high end hotels. As the city has the best sporting facilities in the country, most national-level annual sporting tournaments such as track and field, football, volleyball, tennis and swimming are held in Yangon. The 40,000-seat Aung San Stadium and the 32,000-seat Thuwunna Stadium are the main venues for the highly popular annual State and Division football tournament, and less popular Myanmar League football matches. Despite the enormous popularity of football in Myanmar, the country’s premier football league limps along with little popular interest or commercial success. Most Yangonites prefer watching European football on satellite TV. Yangon is also home to annual the Myanmar Open golf tournament, and the Myanmar Open tennis tournament. The city hosted 1961 and 1969 South East Asian Games. Yangon is the country’s main center for trade, industry, real estate, media, entertainment and tourism. According to official government statistics, the city’s nominal GDP is K2.38 trillion (~US$2 billion) in 2007, about 15% of the country’s GDP of US$13.5 billion. The city is Lower Myanmar’s main trading hub for all kinds of merchandise – from basic food stuffs to used cars although commerce continues to be hampered by the city's severely underdeveloped banking industry and communication infrastructure. Bayinnaung Market is the largest wholesale center in the country for rice, beans and pulses, and other agricultural commodities. Much of the country’s legal imports and exports go through Thilawa port, the largest and busiest port in Myanmar. Manufacturing accounts for a sizable share of employment. At least 14 light industrial zones ring Yangon, employing thousands of workers. But the industrial zones suffer from both structural problems (e.g., chronic power shortages) and political problems (i.e. Western economic sanctions). While Yangon's 2500 factories alone need about 120 MW of power, the entire city receives only about 250 MW of the 530 MW needed. Chronic power shortages limit the factories' operating hours between 8 am and 6 pm. Tourism represents a major source of foreign currency for the city although by Southeast Asian standards the actual number of foreign visitors to Yangon has always been quite low (about 250,000 before Saffron Revolution in September 2007). Cyclone Nargis dampened tourism even farther. The 2008 tourist arrivals at Yangon International are down to less than 50% from the previous year. Yangon's international standard hotels, built with foreign investment in the 1990s, still await the influx of tourists for which they were built. Yangon has the best educational facilities and the highest number of qualified teachers in Myanmar where state spending on education is among the lowest in the world. The disparity in educational opportunities and achievement between rich and poor schools is quite stark even within the city. With little or no state support forthcoming, schools have to rely on forced ‘donations’ and various fees from parents for nearly everything – school maintenance to teachers' salaries, forcing many poor students to drop out. While many students in poor districts fail to reach high school, a handful of Yangon high schools in wealthier districts like TTC, Dagon 1 and Latha 2 regularly send the bulk of the students entering the most selective universities in the country. The wealthy bypass the Burmese education system altogether, sending their children to private English language instruction schools like ILBC and YIEC for primary and secondary education, and abroad (typically Singapore or Australia) for university education. In 2008, international schools in Yangon cost at least US$8,000 a year. Yangon is home to over 20 universities and colleges. While Yangon University remains the most well-known--its main campus is a part of popular Burmese culture (literature, music, film, etc. ), the nation's oldest university today for the most part is a graduate school, deprived of undergraduate studies. Following the 1988 nationwide uprising, the military government has repeatedly shut down universities, and has dispersed most of undergraduate student population to new universities suburbs such as Dagon University, University of East Yangon and University of West Yangon. Nonetheless many of the country's national and most selective universities remain in Yangon. Students from around the country still come to study in Yangon as some subject matters are offered only at its universities. The city's University of Medicine 1, University of Medicine 2, Yangon Technological University, University of Computer Studies, Yangon and Myanmar Maritime University are the most selective in the country. The general state of health care in Yangon is poor. The military government spends anywhere from 0.5% to 3% of the country's GDP on health care, consistently ranking among the lowest in the world. Although health care is nominally free, in reality, patients have to pay for medicine and treatment, even in public clinics and hospitals. Public hospitals including the flagship Yangon General Hospital lack many of the basic facilities and equipment. To be sure, wealthier Yangonites still have access to country's best medical facilities and internationally qualified physicians and surgeons in all branches of medicine. (As many Burmese physicians have emigrated abroad, only do Yangon and Mandalay have any sizable number of physicians left.) The well-to-do go to private clinics or hospitals like Pun Hlaing International Hospital and Bahosi Medical Clinic. A routine ten-day private hospital stay reportedly costs about K2.5 million (US$2300). The rich and top military brass routinely go abroad (usually Bangkok or Singapore) for treatment.